Put away your staple guns, hammers and hot glue! 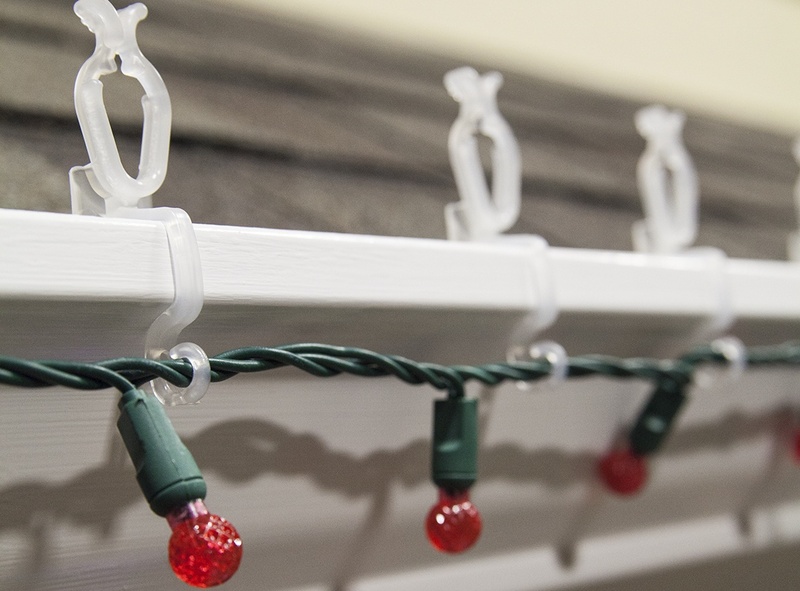 Christmas light clips are the fastest, easiest and most professional way to hang Christmas lights on just about any surface. Yes, we said any surface, even brick! 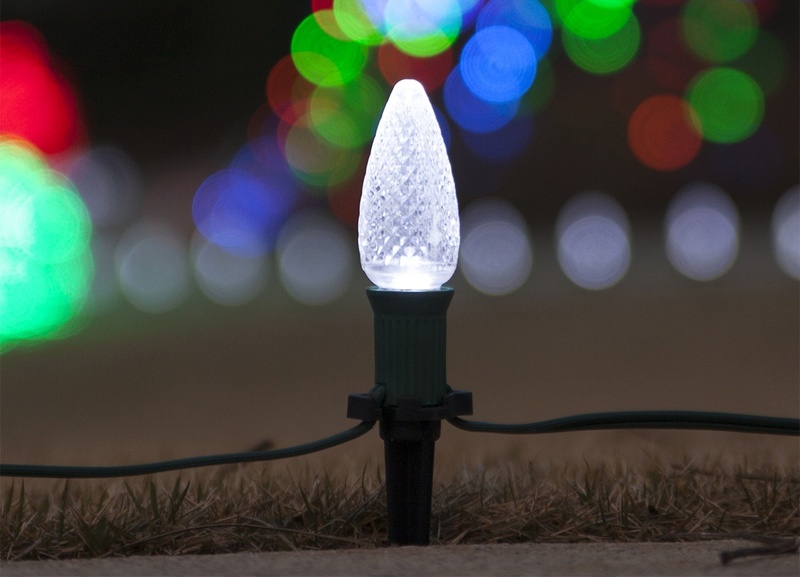 Read our installation tips to hang lights like a pro! Click on the type of light strings you want to hang for a full list of clips you can use and installation instructions! All In One - This is a commercial grade, UV protected light clip used by professional installers. If you want your clips to last through many seasons, the All in One clip is one of the best! Slide the socket of your C7/C9 bulbs into the circular ring of your all in one clip. 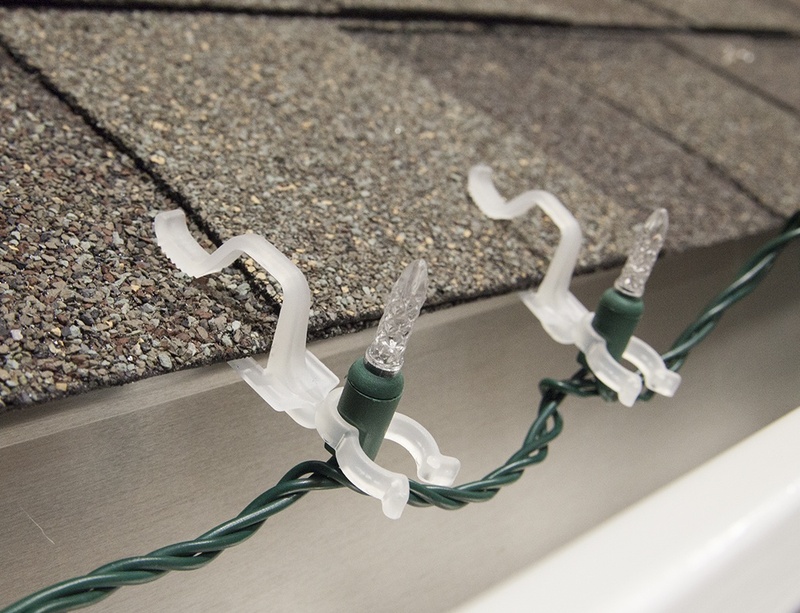 Once all of your lights have clips attached, slide the tab underneath your shingle, the folding tab at the end helps to hold the clip securely in place. 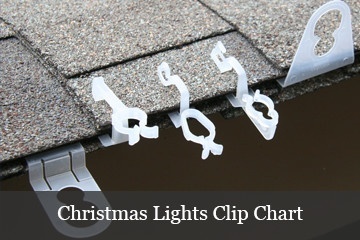 All in One clips will hang lights facing vertically when placed on shingles. 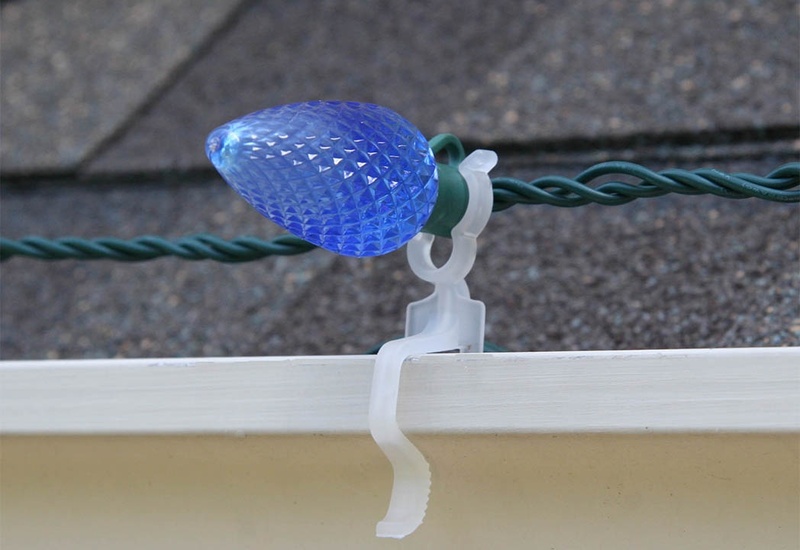 If using this clip on gutters, just slide the clip over the lip of your gutter so that the flat portion of the tab is against the backside of your gutter and the bulbs are facing horizontally or straight out. 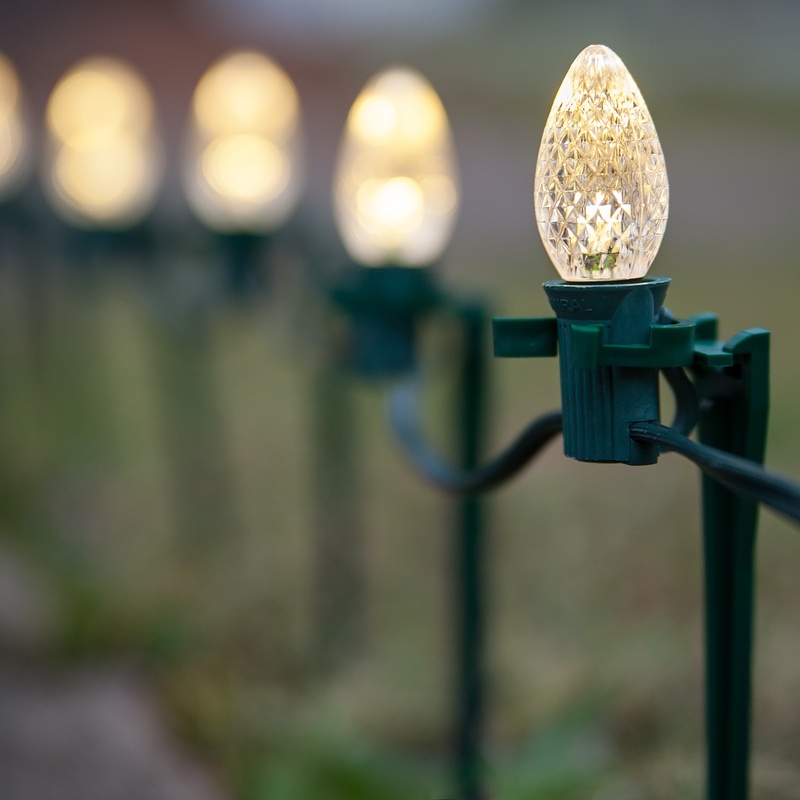 All in One Plus - Say you want to hang C7/C9 bulbs on one part of your home, but you'd also like to be able to hang icicle lights or mini lights in another area, or maybe you want to hang C7/C9 lights on your gutter and layer icicle lights or mini lights underneath. If so, this is the versatile clip you have been searching for! 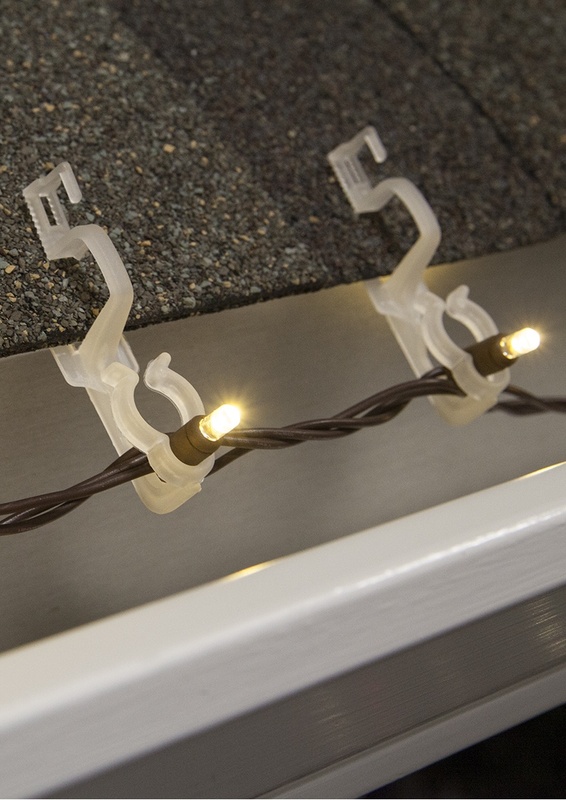 The "plus" part of the All In One Plus clip is the unique ability to hang two strings of lights simultaneously on gutters. 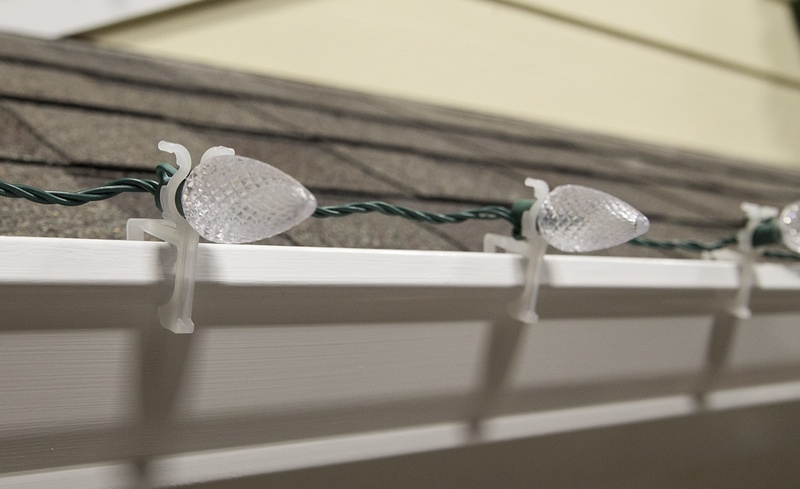 If hanging lights on gutters and planning to hang two light types at once, you can fit your icicle string lights into the small anterior hook at the other end of the clip. However, you may find it easier to hang all of your C7/C9 strings and then come back and attach the icicle lights to the clips. 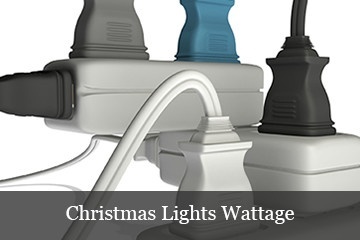 Once all of your lights have clips attached, slide the tab underneath your shingle. 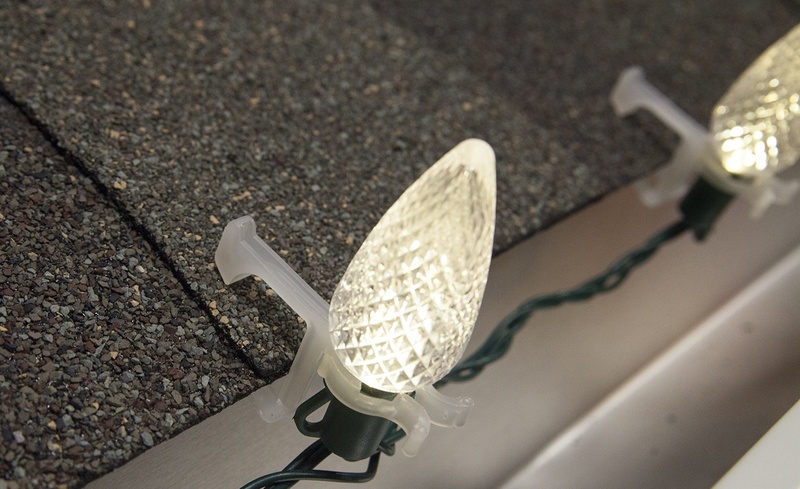 When used on shingles, the lights will have a vertical orientation and the hook will rest at the top of the shingle. 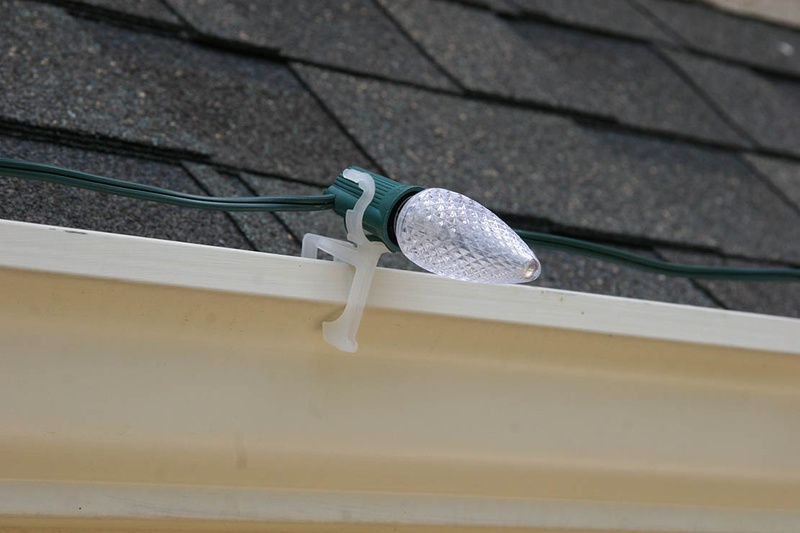 For installation on gutters, just slide the clip over the lip of your gutter so that the flat portion of the tab is against the backside of your gutter and the bulbs are facing horizontally or straight out. The hook for mini lights should be just under the lip of the gutter and available for use. Omni All In One - Similar to the All in One Plus clips, the Omni All In One features a hook at one end and a place for bulb sockets at the other which allows for two lights to hang simultaneously. 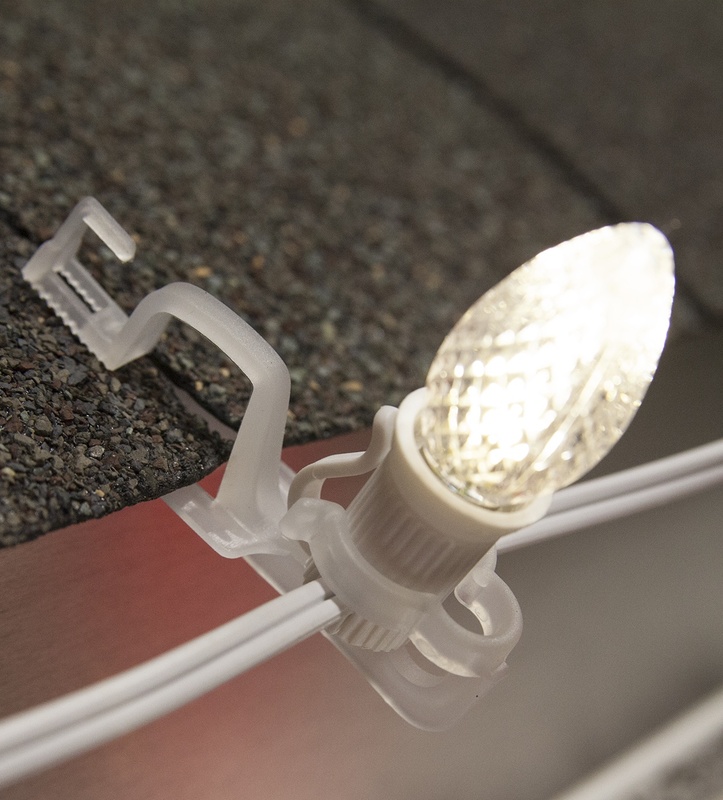 The Omni All In One clip also has a smaller socket opening for mini lights, as well as a long, serrated edge which can hold the clip securely under longer shingles. 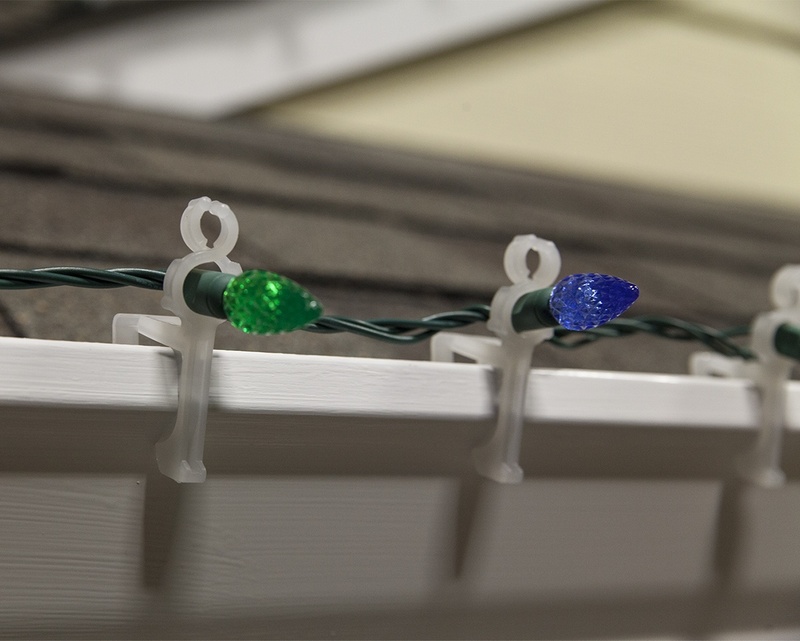 If hanging lights on gutters and planning to hang two light types at once, you can fit your icicle mini lights into the small anterior hook at the other end of the clip. However, you may find it easier to hang all of your C7/C9 strings and then come back and attach the icicle lights to the clips. 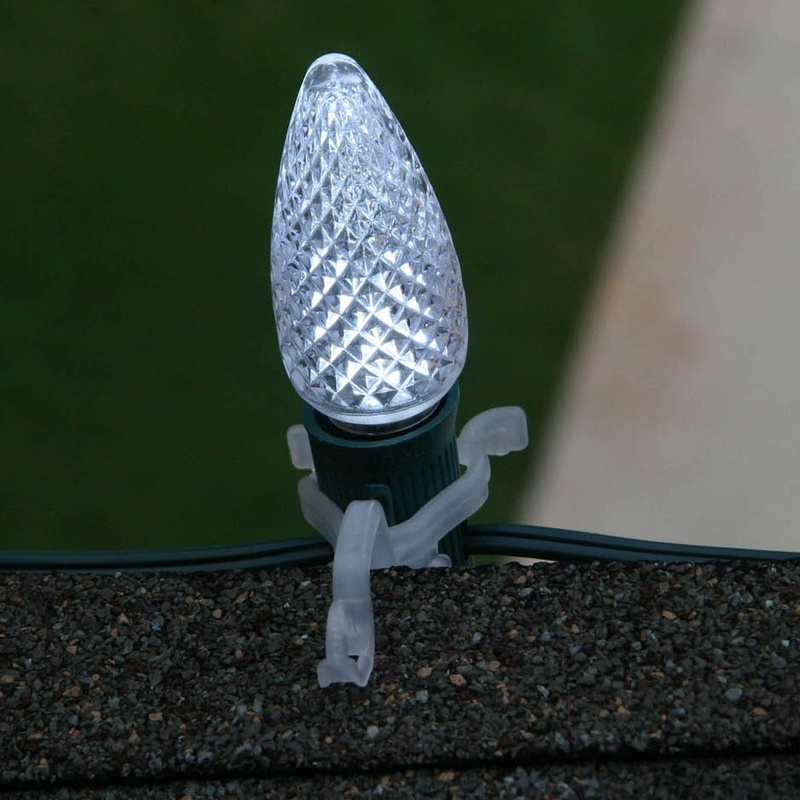 Once all of your lights have clips attached, slide the tab underneath your shingle. When used on shingles, the lights will have a vertical orientation and the hook will rest at the top of the shingle with the serrated edge firmly gripping the underside of your shingle..
For installation on gutters, just slide the clip over the lip of your gutter so that the serrated portion of the tab is against the backside of your gutter and the bulbs are facing horizontally or straight out. The hook for icicle lights should be just under the lip of the gutter and available for use. *Original Shingle Tab - This is a commercial grade, UV protected light clip used by professional installers and built to last through many seasons of use. Shingle tabs can be secured underneath gutters or shingles. Light bulbs will have a vertical orientation when used under gutters and a horizontal orientation when under shingles. Installation is as easy as screwing the bulbs into their sockets with the clip positioned in between. 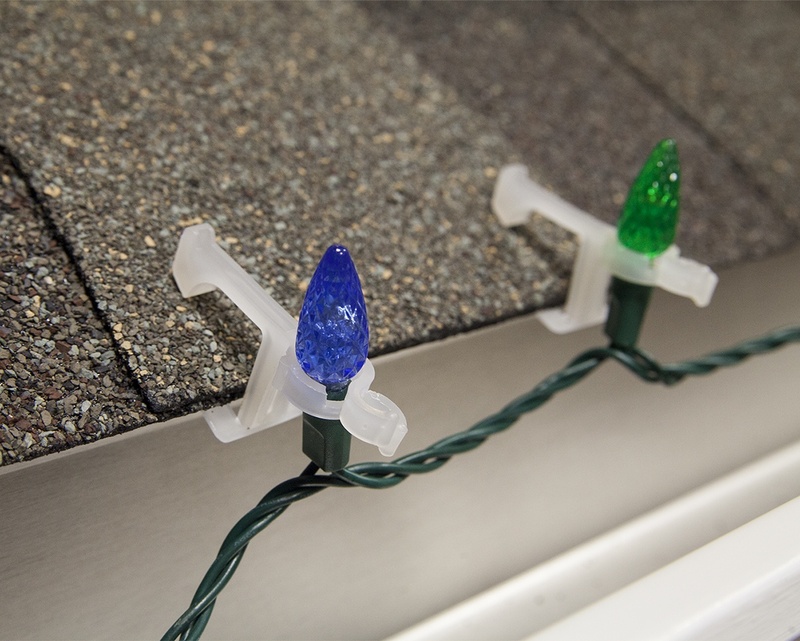 Once bulbs are secure, just wedge the legs in the space between your shingles and roof or in the space between the gutter and the side of your house. When placed under gutters, bulbs will face down and when used on shingles bulbs will face straight out. 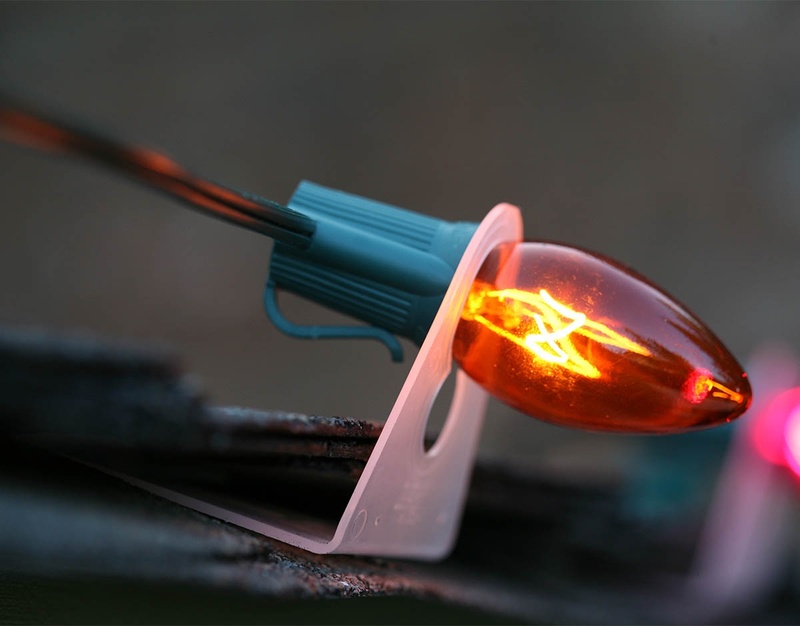 Gutter Hook - This is one small but mighty light clip! 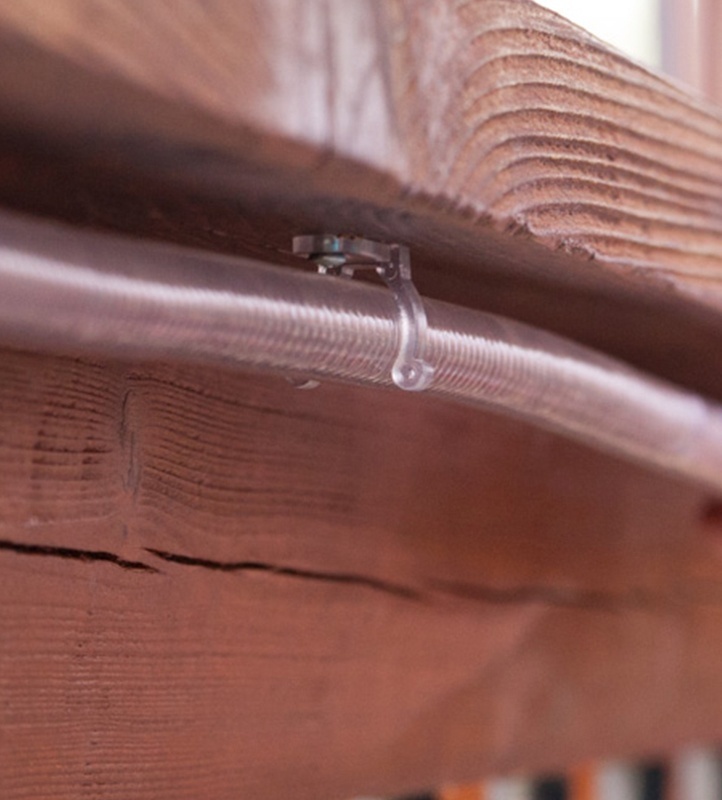 Gutter hooks work on any type of light strings and hold tight to gutters. The small size of this clip makes them perfect for maneuvering lights around tight corners too! To use the gutter hook, just slip your light string through one end of the hook and slide the other end of the hook over the lip of your gutter! These clips hold extra tight, so it is important to remove them one at a time when the season is over. Trying to pull them down with a tug of the light string might result in bringing the gutter down too! *Parapet Clip - This is a commercial grade, UV protected light clip built for permanent installation and used by professional installers. 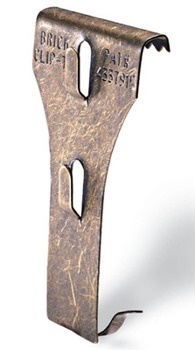 The parapet clip is designed to sit on flat surfaces and acts as a channel to hold the original shingle tab (see above). The parapet clip can be installed with screws, however many professional installers prefer to use a silicon adhesive to mount the clips so as to avoid creating holes in surfaces. After the clip is attached, you can slide an original shingle tab into the channels where it will be held securely until removed. Parapet clips cannot be seen from the ground which makes them ideal for leaving up year round even after shingle tabs are removed. *Combo C Clip - This is a commercial grade, UV protected light clip built for permanent installation and used by professional installers. Combo C Clips can be installed with screws, however many professional installers prefer to use a silicon adhesive to mount the clips so as to avoid creating holes in surfaces. After the clip is in place gently slide bulbs into the open ring of the clip. One side is larger for C9 bulbs while the opposite end fits C7 bulb sizes. LED All In One - Specially designed to tightly hold the smaller socket sizes of prelamped LED strings, with a serrated edge for extra grip on shingles and gutters. 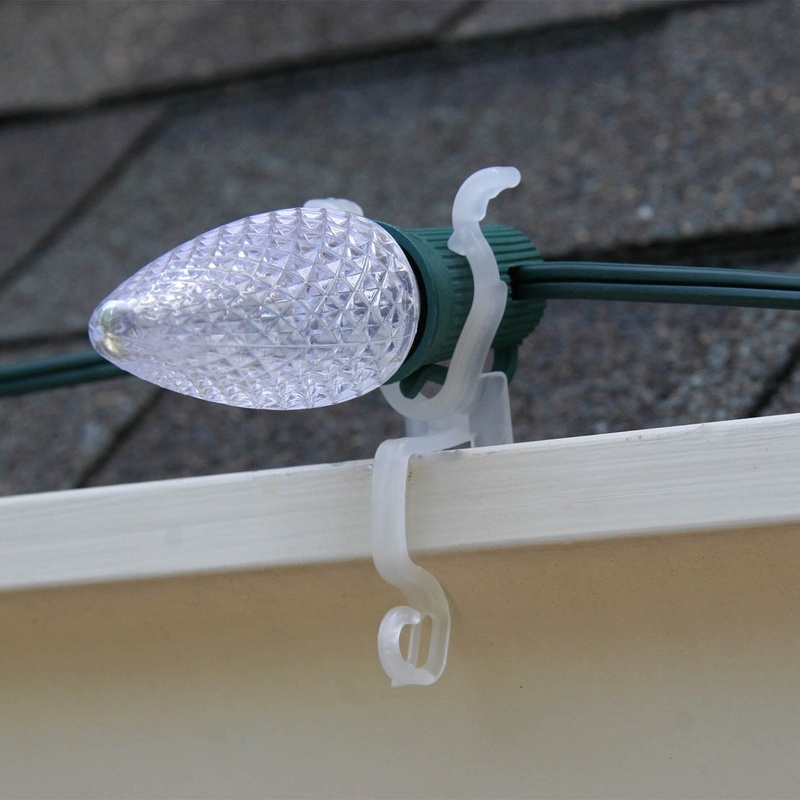 Once all of your lights have clips attached, slide the tab underneath your shingle. When used on shingles, the lights will have a vertical orientation and the serrated edge will firmly grip the underside of your shingle. For installation on gutters, just slide the clip over the lip of your gutter so that the serrated portion of the tab is against the backside of your gutter and the bulbs are facing horizontally or straight out. *All In One - This is a commercial grade, UV protected light clip used by professional installers. If you want your clips to last through many seasons, the All in One clip is one of the best! Omni All In One - Similar to the All in One Plus clips, the Omni All In One features a hook at one end and a place for bulb sockets at the other which allows for two lights to hang simultaneously when used on gutters. The Omni All In One clip also has a smaller socket opening for mini lights, as well as a long, serrated edge which can hold the clip securely under longer shingles. If applicable, slide C7 or C9 bulbs inside the wider curved latches at one end of the clip or your mini light sockets into the smallest opening at the end of your clip leaving the wider portion open. 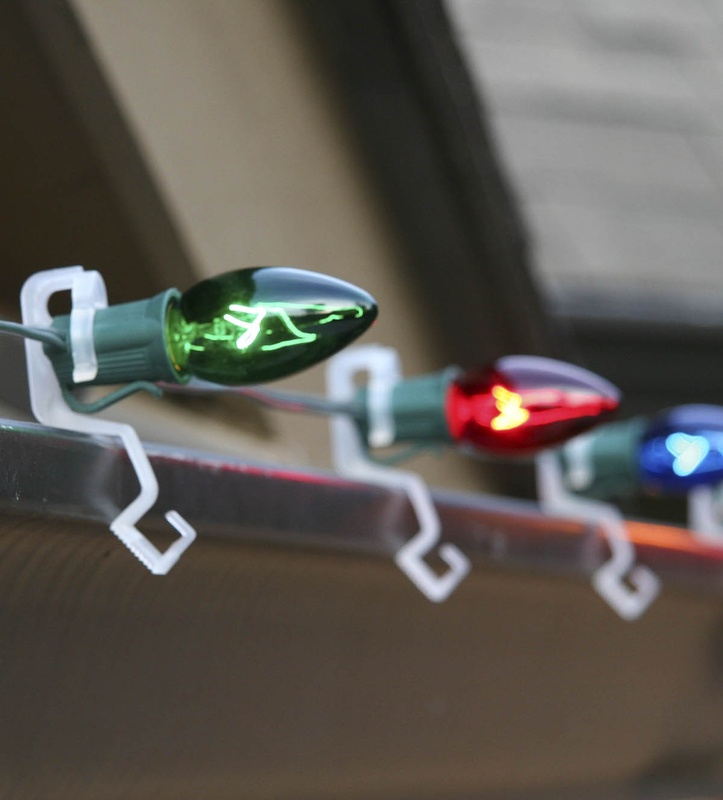 If hanging lights on gutters and planning to hang two light types at once, you can fit your icicle lights or any other string light variety into the small anterior hook at the other end of the clip. However, you may find it easier to start by attaching and hanging all of your C7/C9 strings or mini lights to the rounded portion of the clip as described in step 1 and then come back to attach the string lights to the hook on your clips. 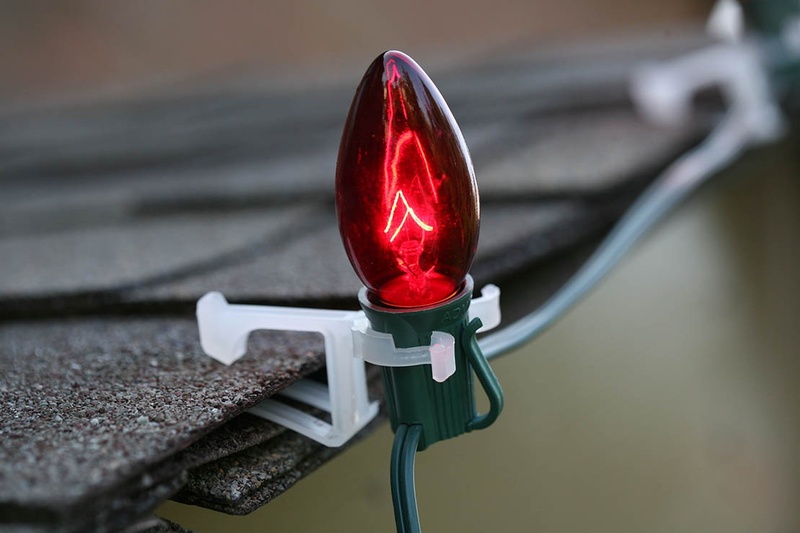 Once all of your lights have clips attached, slide the tab underneath your shingle. When used on shingles, the lights will have a vertical orientation and the hook will rest at the top of the shingle with the serrated edge firmly gripping the underside of your shingle. 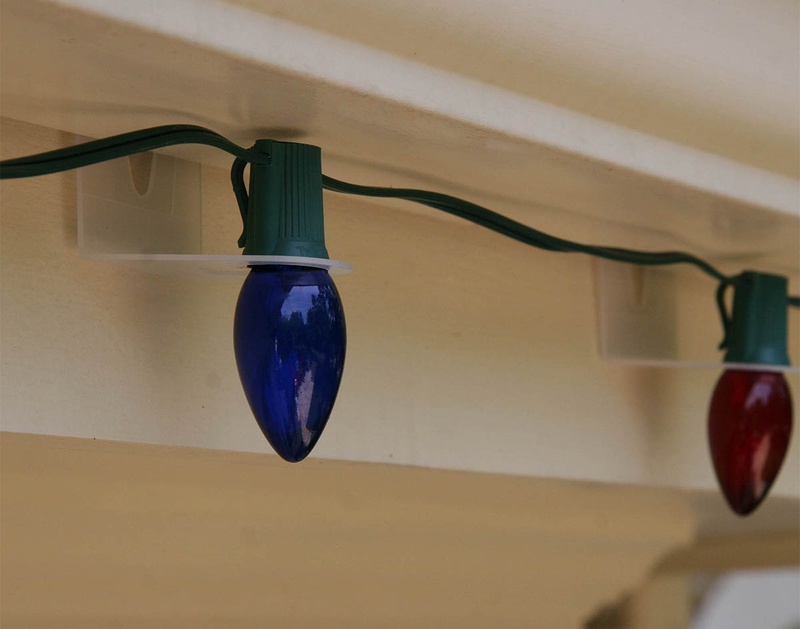 All in One Plus - Say you want to hang C7/C9 bulbs on one part of your home, but you'd also like to be able to hang icicle lights or mini lights in another area, or maybe you want to hang C7/C9 lights on your gutter and layer icicle lights underneath. If so, this is the versatile clip you have been searching for! 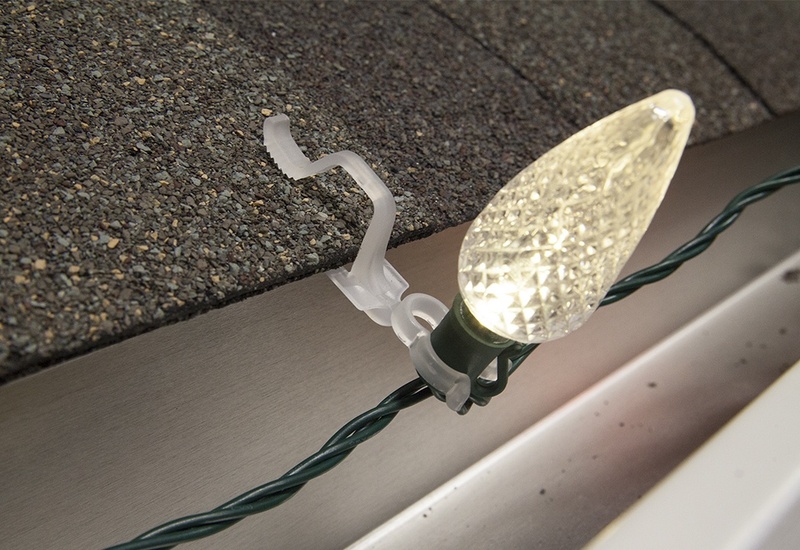 The "plus" part of the All In One Plus clip is the unique ability to hang two strings of lights simultaneously on gutters. If applicable, slide your C7 or C9 bulbs inside the curved latches at one end of the clip. 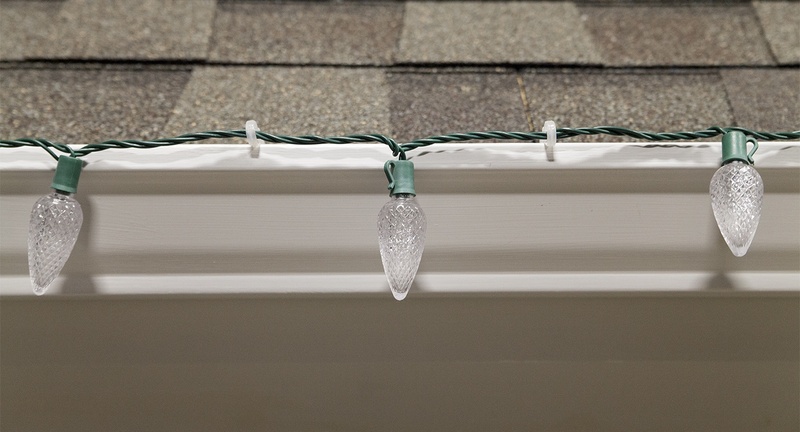 If hanging lights on gutters and planning to hang two light types at once, you can fit your icicle string lights into the small anterior hook at the other end of the clip. However, you may find it easier to hang all of your C7/C9 strings and then come back and attach the mini lights to the clips. *All In One - (does not fit G12, 5mm and M5 LED minis, or regular incandescent mini lights) This is a commercial grade, UV protected light clip used by professional installers. If you want your clips to last through many seasons, the All in One clip is one of the best! 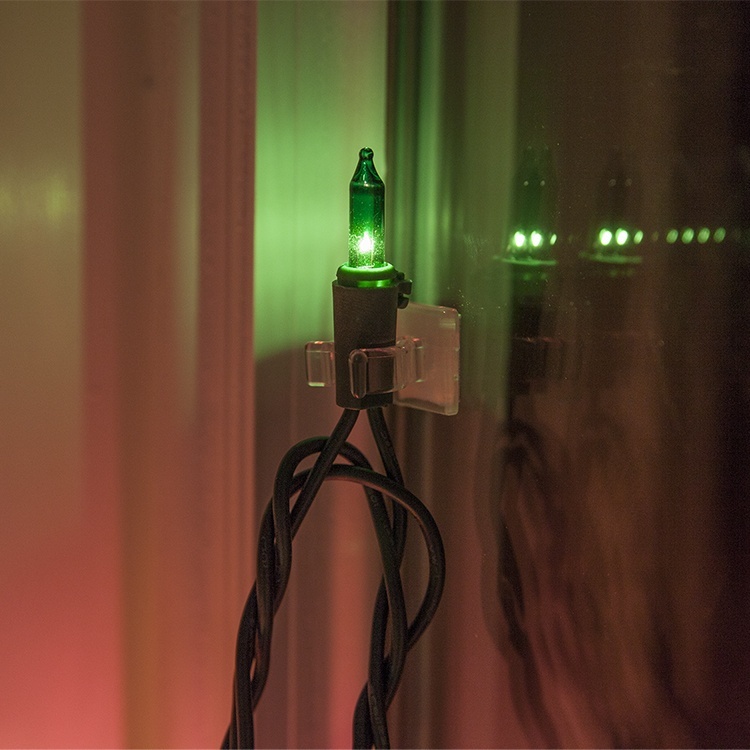 Slide the socket of your C6 Strawberry LED mini lights into the circular ring of your all in one clip. Then squeeze and twist the ends of the clip together so that the ring fits tightly around the light socket. Gutter Hook- This is one small but mighty light clip! 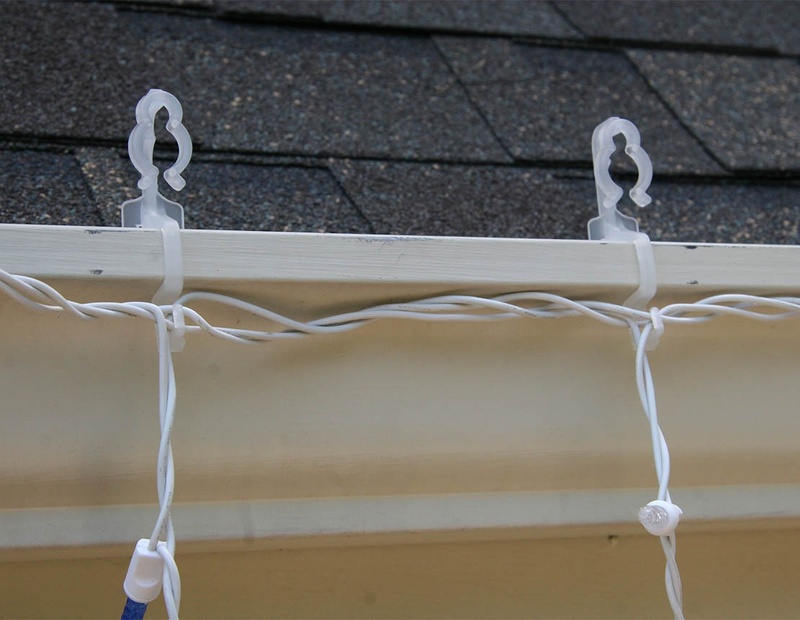 Gutter hooks work on any type of light strings and hold tight to gutters. 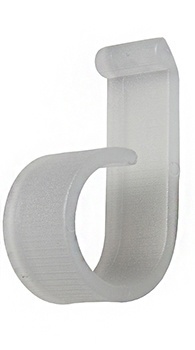 The small size of this clip makes them perfect for maneuvering lights around tight corners too! To use the gutter hook, just slip your light string through one end of the hook and slide the other end of the hook over the lip of your gutter! These clips hold extra tight, so it is important to remove them one at a time when the season is over. Trying to pull them down with a tug of the light string might result in bringing the gutter down too! Mini Light Adhesive Clips- Use adhesive clips on a smooth, clean surface to create words and shapes or just outline a window or frame. Once in place, just slide mini light sockets into the opening on the clip! Create heart, christmas tree and star shapes on windows or spell out letters. Outline window frames for Christmas or anytime of year. Add ambient room lighting by outlining your mirror with lights. Hang icicle lights from windows, mirrors or glass. All in One Plus - Say you want to hang C7/C9 bulbs on one part of your home, but you'd also like to be able to hang icicle lights in another area, or maybe you want to hang C7/C9 lights on your gutter and layer icicle lights underneath. If so, this is the versatile clip you have been searching for! 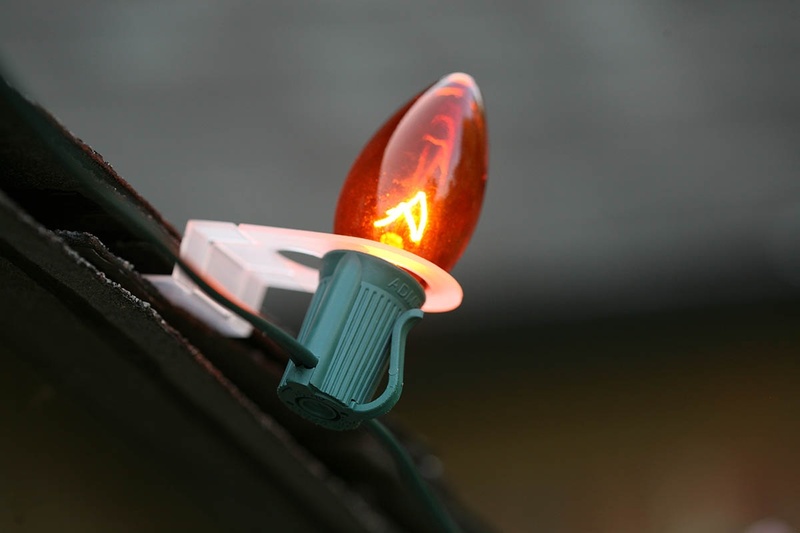 The "plus" part of the All In One Plus clip is the unique ability to hang two strings of lights simultaneously on gutters. 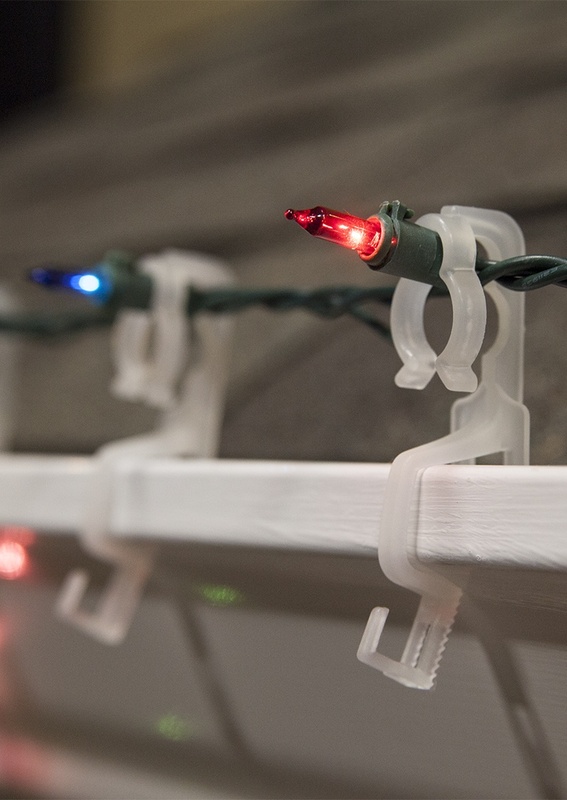 If you are planning to hang two light types at once, you can fit your icicle string lights into the small anterior hook at the other end of the clip. However, you may find it easier to hang all of your C7/C9 strings and then come back and hook the icicle lights to the clips. If you are only hanging icicle lights, it is easiest to place the clip on the gutter and then hang your lights from the hook. To install the All In One Plus clip, just slide the open edge of the clip over the lip of your gutter so that the flat portion of the tab is against the backside of your gutter and the bulbs are facing horizontally or straight out. 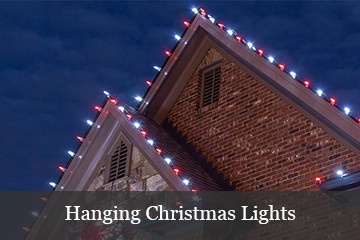 The hook for to hang your lights should be just under the lip of the gutter and available for use. Omni All In One - Similar to the All in One Plus clips, the Omni All In One features a hook at one end and a place for bulb sockets at the other which allows for two lights to hang simultaneously when used on gutters. The Omni All In One clip also has a smaller socket opening for mini lights, as well as a long, serrated edge which helps to hold the clip securely in place. 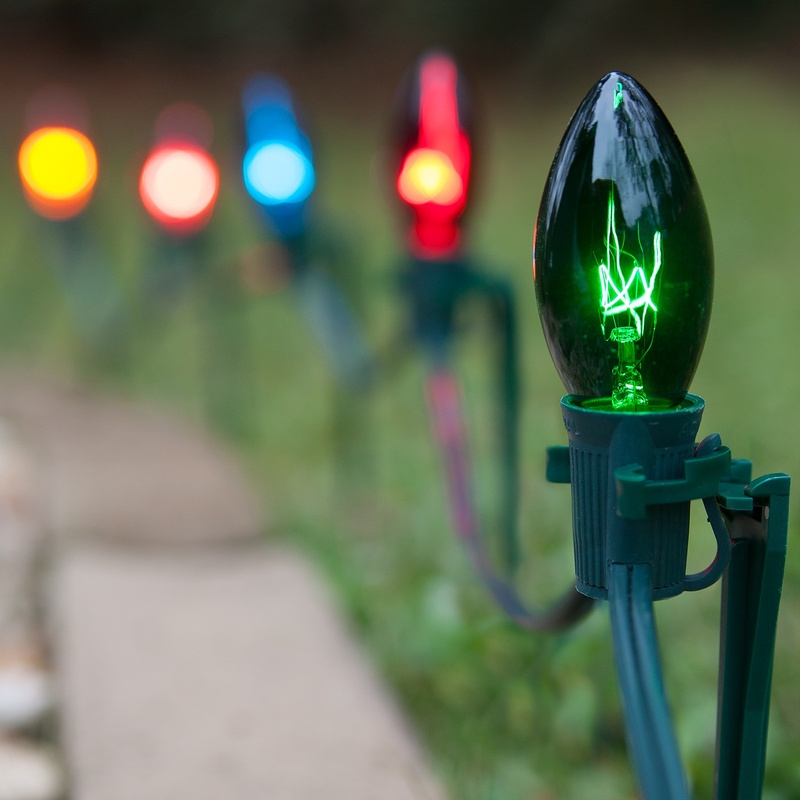 If you are planning to hang two light types at once, you can fit your icicle lights or any other string light variety into the small anterior hook at the other end of the clip. However, you may find it easier to start by attaching and hanging all of your C7/C9 strings or mini lights to the rounded portion of the clip as described in step 1 and then come back to attach the string lights to the hook on your clips. If you are only hanging icicle lights, it is easiest to place the clip on the gutter and then hang your lights from the hook. 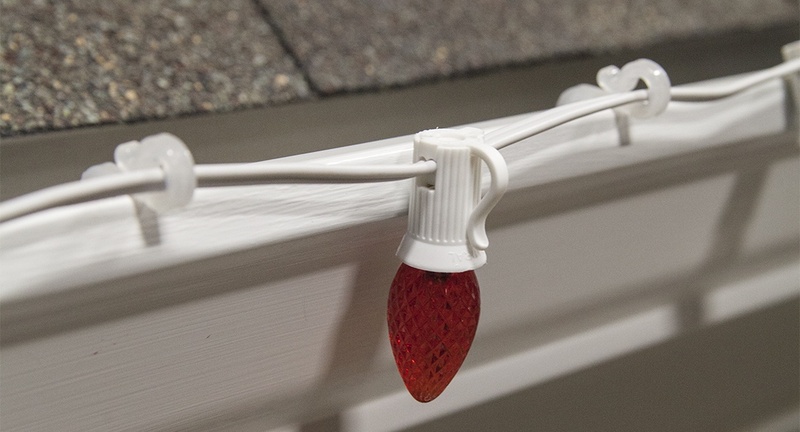 To install, just slide the clip over the lip of your gutter so that the serrated portion of the tab is against the backside of your gutter and the bulbs are facing horizontally or straight out. The hook for icicle lights should be just under the lip of the gutter and available for use. Rope light clips can be used both indoors and out to create custom lettering, track lighting, holiday designs and more. Clips are available in multiple sizes to accommodate rope light diameters from 13-5mm. You can find our full selection of rope light accessories here. 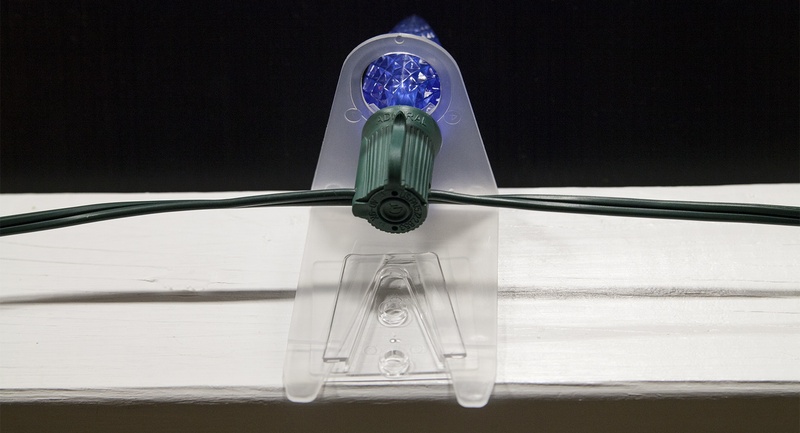 Mounting Clips - Attach mounting clips to any surface with screws or silicone adhesive, then push your rope light tubing through the opening on the clip where it will be held securely in place. Crocodile Clips - Our most heavy duty rope light clip! Crocodile clips can be installed either with a screw through the center or silicone adhesive placed on the bottom of the clip. Crocodile clips feature an interlocking design allowing multiple rope light channels to run evenly side by side and teeth on the inside of the opening to ensure that rope lights stay put. If you're looking for a rope light clip that can last through multiple seasons of uses, this is the clip for you! Attach wreaths garland, lights and decorations to brick with brick clips and save your mortar from damaging screws and nails! Brick clips come in two sizes and each have two hooks on the front for hanging decorations with ease. Just pick the size that works best for your brick and fit the jagged edge over the top of the brick surface and the curved edge will slide along the bottom edge. Standard Brick Clip - Made to fit standard 2 1/8" to 2 1/2" bricks. 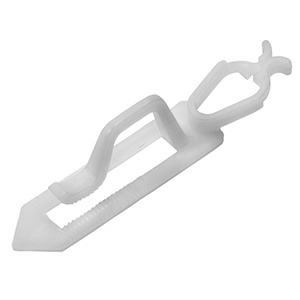 Queen Brick Clip - The queen brick clip grabs onto 2 1/2" to 2 3/4" brick. 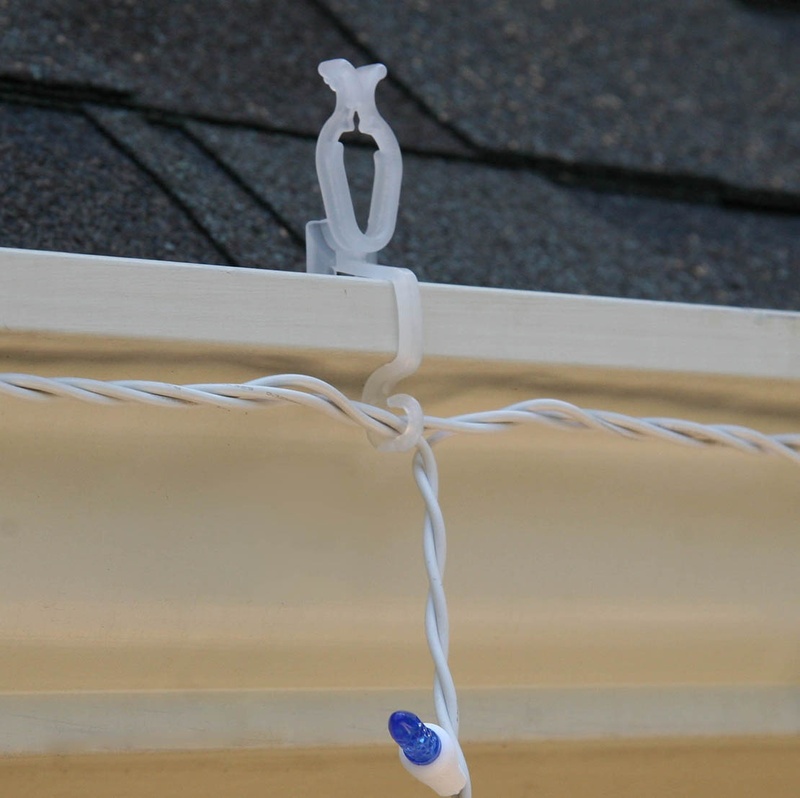 Siding Hook - Hang any type of string light on vinyl siding with the help of siding clips. 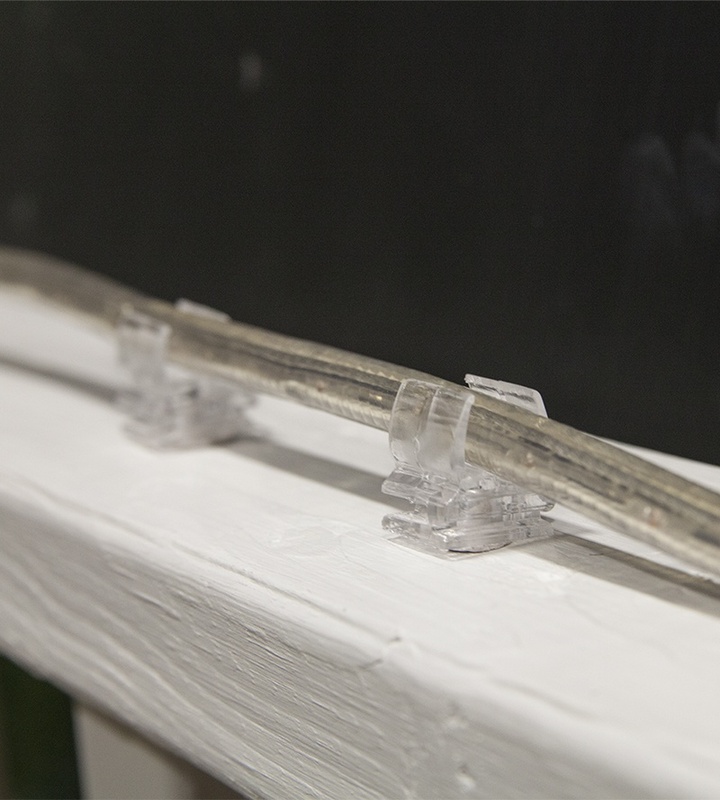 Siding hooks are easy to use and relocate without the need for tools and nails. 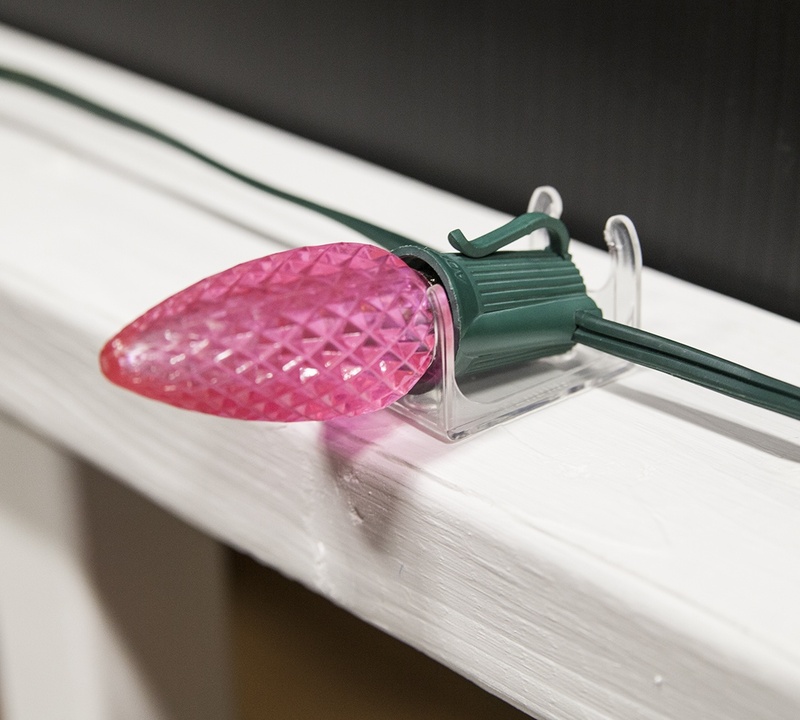 To install, simply place light strings on the hook end of the clip and slip the straight edge into the seam of your siding. 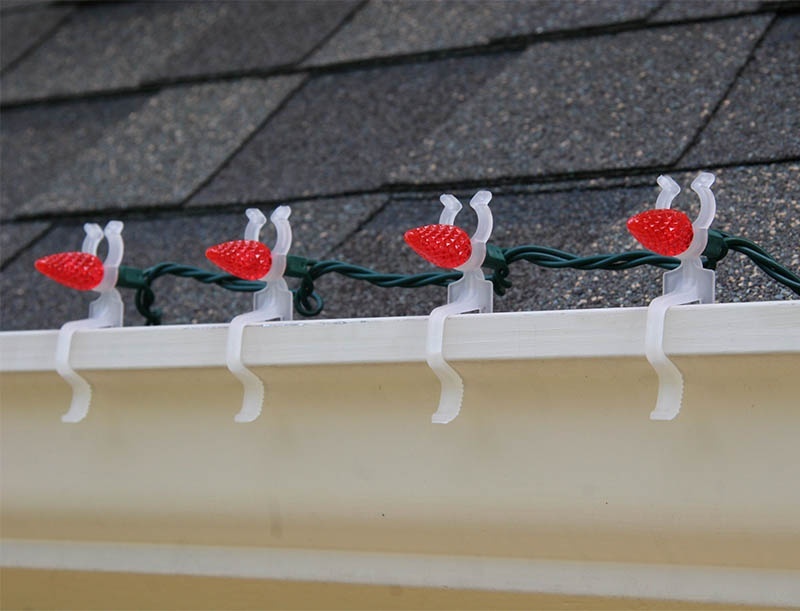 Tile Clip With Grip - Sturdy "gator" teeth help to hold the tile clip in place allowing C7, C9 and C6 style Christmas lights to hang on both rounded barrel and flat clay tiles. Slide C7 or C9 sockets inside the wider curved latches at one end of the clip. If you are using C6 strawberry LED lights you will need to squeeze and twist the ends of the clip together so that the ring fits tightly around the smaller socket. 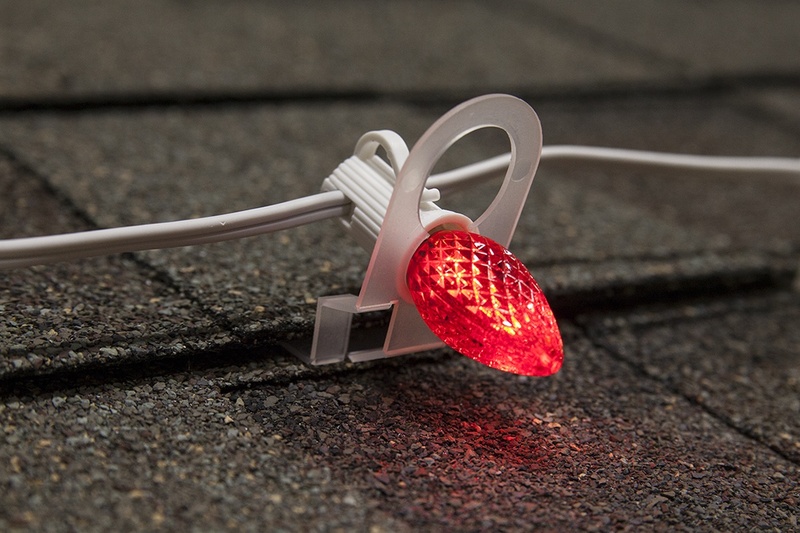 Once all of your lights have clips attached, slide the pointed edge of the tab underneath your tile, much like you would if working with shingles. The lights will have a vertical orientation and the serrated edges will firmly grip the underside and top of your tile. 4.5" Universal Light Stake - One of the sturdiest light stakes, universal light stakes work best with standard C7 and C9 sockets. Just sit the socket on top of the stake and slide the light string through the hooks on each side. Then insert the stake into the ground, until the bulb sits just above ground level. 7.5" All In One Light Stake & 15" All In One Light Stake - Slide the sockets of C7 or C9 light bulbs into the curved latches at the top of All in One Light stakes and then push them into the ground at your preferred height. For snow prone areas, the height of the stake should be taken into consideration.